Home → Shop → Specialty Items → High Style & Tropicals → ooh, la, la! ooh, la, la! We love it when our customers let us design beautiful creations of our choice! Sure, you’re welcome to choose from this amazing website (and who wouldn’t find something amazing here!) 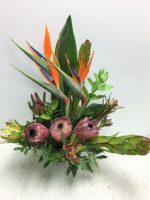 but another great option for you is to give us an idea (in this case Hawaiian or Birds of Paradise) and let us take the ball and run with it! 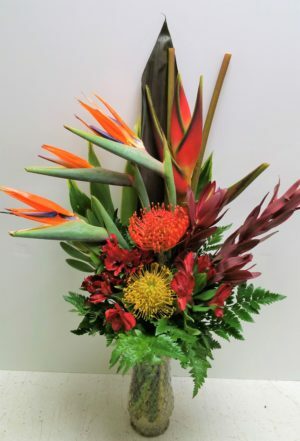 Our Hawaiian flowers arrive fresh twice a week. Because they come directly from Hawaii, we never know exactly what we’ll receive, and that’s part of the fun! The selection varies, and we have no control. All we know for sure is the selection is stunning! And you won’t be disappointed! Leave it to Pamela! She creates magic! You can tell when you see this floral arrangement, that was custom designed for a 90th birthday! Wouldn’t it convey your love and affection? Gee, I think it would! We have lots of other options. Here are a few for you to consider. 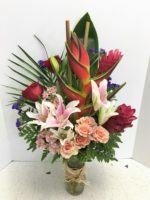 These arrangements are delivered locally. 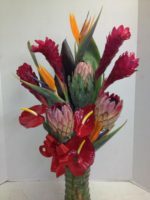 We can not guarantee that another florist will have the beautiful Hawaiian flowers that we carry in our shop.